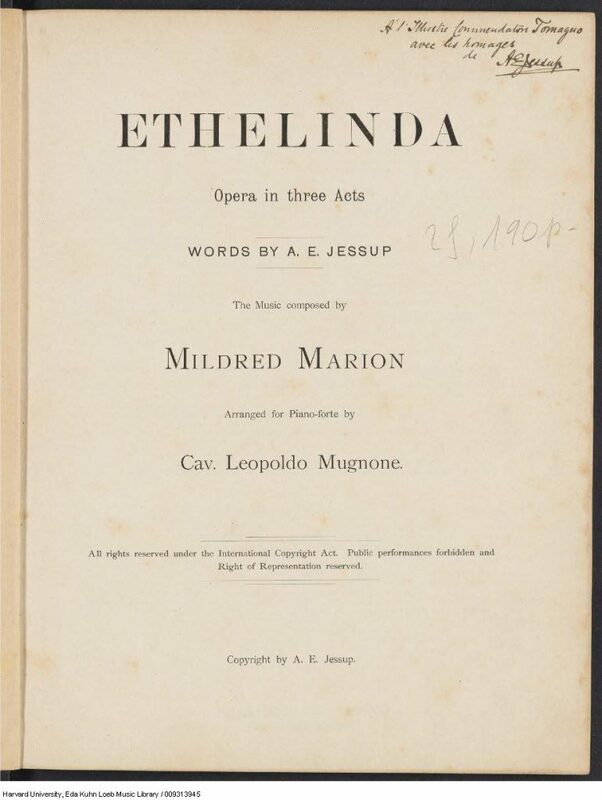 This is the only known score of Etelinda, an opera in three acts by Mildred Marion. First performed in Florence in 1894, it was published in this vocal score version the following year. The libretto has been translated into English, and in the Music Library’s copy a second version of the finale laid in at the end is annotated, the Italian text restored by hand in red ink. 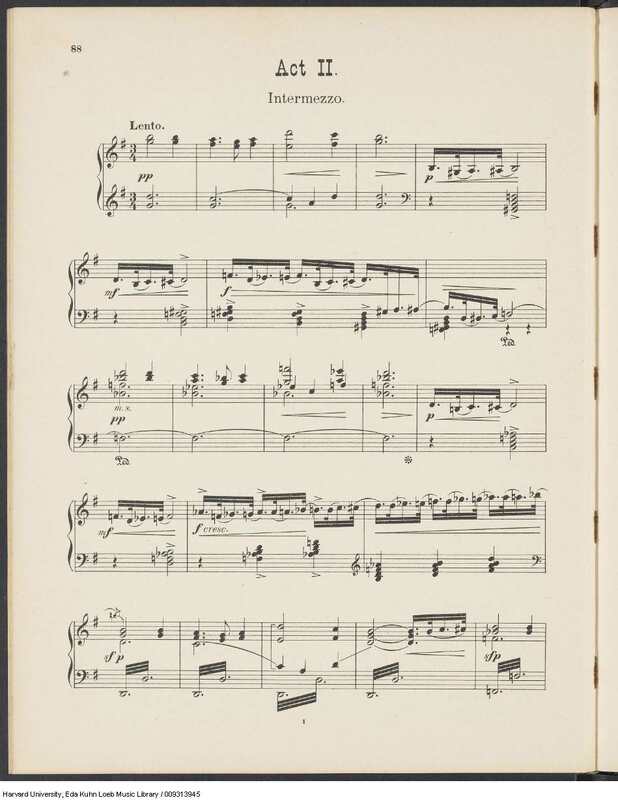 The score appears to have been self-published, as there is no publication information on the title page. It is enclosed in what is known as a publisher’s binding. The cover is paper, as opposed to the leather more commonly used in the first half of the nineteenth century for covering self-published scores. The composer’s name and the English title, generically stylized, ornament the front. As there are no other known copies of this score in library catalogues one wonders whether a small number were created for the composer and librettist to present as gifts; this copy is inscribed A’l Maestro Commendatore Tomagno avec les homages de A.E. Jessup. It was given in 2002 by Professor Emeritus John M. Ward. We happen to know a bit about both the librettist and the composer. The composer’s full name was Mildred Marion Jessup, previously Lady Mildred Marion Bowes-Lyon. She lived from 1868 to 1897, was raised in a musical family and in 1890 married Augustus Edward Jessup, an American businessman (and the librettist for Etelinda). She is listed in the Biographical Dictionary of Scottish Women. There are no parameters for searching library catalogs which reliably bring together musical works by women. Library of Congress Subject Headings does include the term Women composers but this is meant to be used to describe books which address music by women specifically, for example the excellent bibliographies in the Greenwood Press Music Reference Collection (see here for Helen Walker-Hill’s Piano Music by Black Women Composers then click on one of the subject headings at the end of the record, such as African American women composers or Women composers, Black to browse more subdivisions of this heading). Other subject searches that yield secondary literature are Feminism and music and Music by women composers (right between Music by Sultan composers and Music, Byzantine). How, then, might we tease scores of music by women composers out of library systems? The absence of a publisher or a place of publication can be a clue. 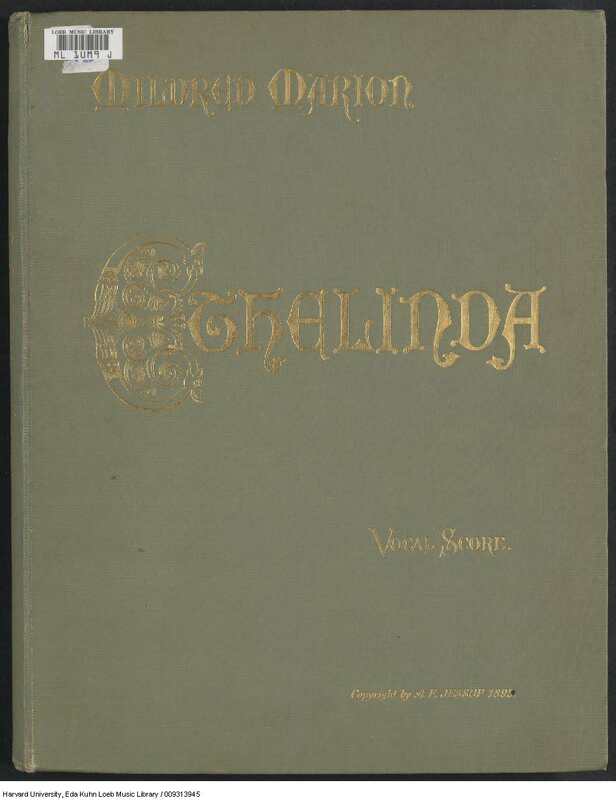 To take this record for Etelinda as a starting point, one technique would be to target these self-published or privately published scores. The terms s.l. and s.n., abbrevations of the Latin terms sine loco and sine nomine, were until 2013 used by Harvard Library catalogers to signal that no place of publication or publisher’s name could be seen or inferred. We now use the English-language terms place of publication not identified and publisher not identified in these situations. If there is a likely place of publication or publisher, then that is supplied in brackets, sometimes followed by a question mark, so any score upon which such research has been performed already by the cataloger would have escaped receiving an s.l. or s.n. or the English equivalents. And, if we associate this sort of binding with the sort of composer who may not have achieved commercial prominence, we can further infer that a keyword search for binding, limited to scores, will generate at least a few interesting results. The complete results of that search are 33 items, of which four have female authorship (two composers, two compilers). It is likely that we will soon be able to search library catalogs and other databases by the gender of the composer and in fact the gender of any other person affiliated with a work. RISM, the online inventory of musical sources, includes this information in its name authority records. Catalogers working in the back end of the database can filter search results by the gender of the composer (the choices are male, female and unknown). This filter isn’t available to users searching in the public interface but the data are there and theoretically actionable. Earlier this month, RISM made available a spreadsheet listing all 803 known women composers in the database. A last, difficult but effective way to discover scores by female composers in a library catalog is simply to cross-reference between a list of known female composers and the catalog, painstakingly searching one name at a time. Here, for example, is IMSLP’s Women composers category. But nowhere on this list do the names Marion, Bowes, Lyon or Jessup appear (although there is another Mildred). 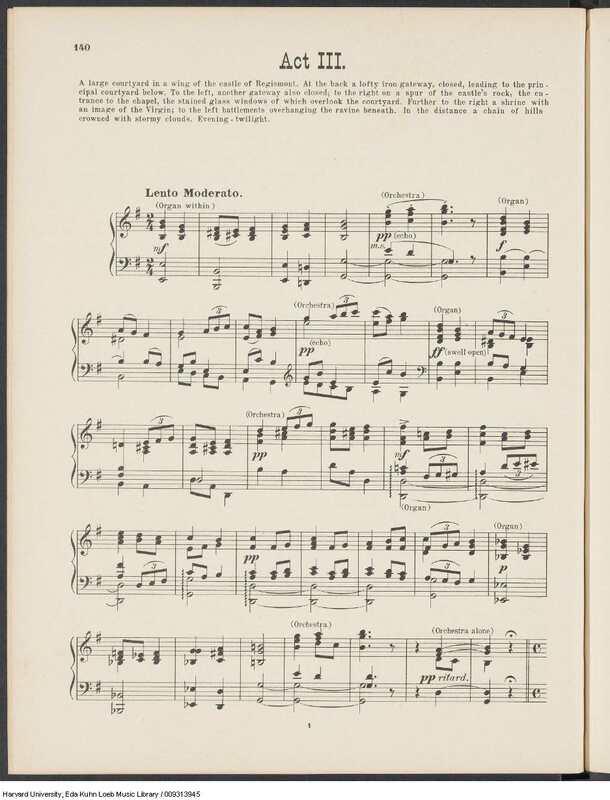 Isham Memorial Library is the special collections unit within the Loeb Music Library. Many of its materials are in open stacks, with rare and unique items held in the locked Merritt Room. To view Merritt Room materials, use your Special Collections Request Account. As Isham is not always fully staffed it is advisable to wait for a confirmation message from a staff member before you plan your visit. Before beginning work under the Pforzheimer Fellowship, I hadn’t dealt with manuscripts much – certainly not in the amount of detail required to create a catalog entry. One thing I noticed is just how unique manuscript materials are. The Hubbard manuscript isn’t a collection of pieces, already existing in a set order, copied out one after the other by a dutiful scribe; it bears the marks of many hands and has a history of many years. It’s certainly not as straightforward as most of the printed texts you or I deal with most of the time! The Hubbard manuscript is actually a series of additions to a print book: the 1746 edition of Thomas Walter’s popular and brief guide entitled The grounds and rules of musick explained: or, an introduction to the art of singing by note. Fitted to the meanest capacities. (Yes, that is the 18th-century way of saying “Reading music for dummies”.) The print book has only 25 pages of instruction, followed by 16 pages of tunes for practice and enjoyment – small enough to prompt aspiring singers to copy out their own selections and have them bound at the back of the book. Colonial New England being what it was, all the tunes, both in the original print book and in the subsequent manuscript additions, were for sacred texts. Most of them were intended to be sung to metrical psalms, which were commonly sung in Puritan and Congregational churches of the time. Books such as Walter’s were created to help people learn to read music and sing in harmony and rhythm. 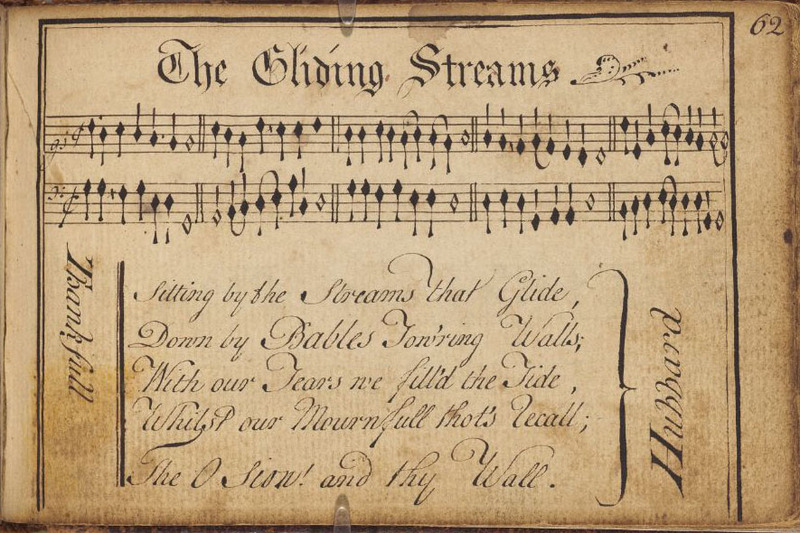 Prior to this time, singing in church was a bit of a mess: the deacon would sing a line of psalm text (“lining it out”) to one of a few well-known tunes, and the members of the congregation would follow at their own pace and with their own ornamentation. It took forever, and wasn’t terribly true to the music of the psalm tunes. The music reformers of the day set out to fix this by systematically training people in musical literacy. Old habits die hard, however, and churches split over tension between the resulting factions. The introduction to Walter’s book is actually a defense of the New Way, as it was called – or perhaps it is more of a polemic against the “Old Way” – and its case is strengthened by recommendations from prominent New England ministers. Thomas Hubbard served as deacon for Old South Church for 25 years, and as treasurer to Harvard College from 1752 to 1773. His daughter, Thankfull, was 14 years old at the time when she acquired the book: the present binding, which must have been of the print book together with (mostly?) 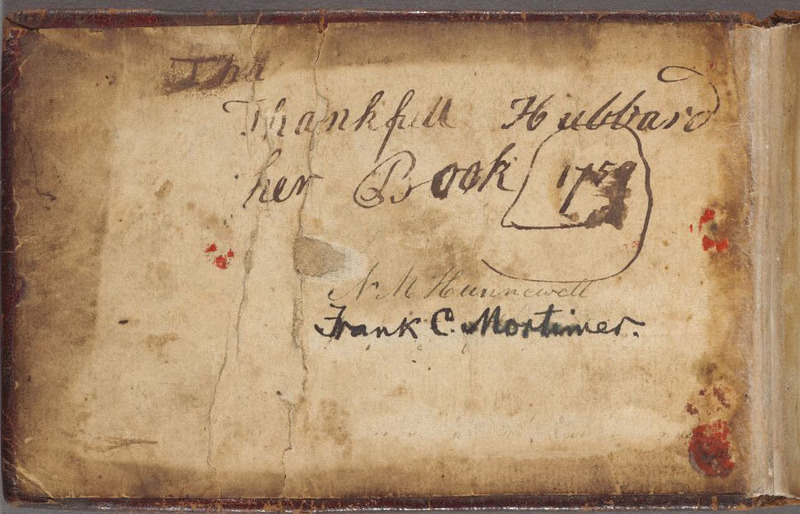 blank manuscript pages, is tooled on the front with the words “THANKFULL HUBBARD 1759”. The front pastedown has the words “Thankfull Hubbard her Book 1759” in what is plausibly the hand of a fourteen-year-old. But to get back to the subject of Thankfull’s book: there are at least two portions to the manuscript component of the volume. 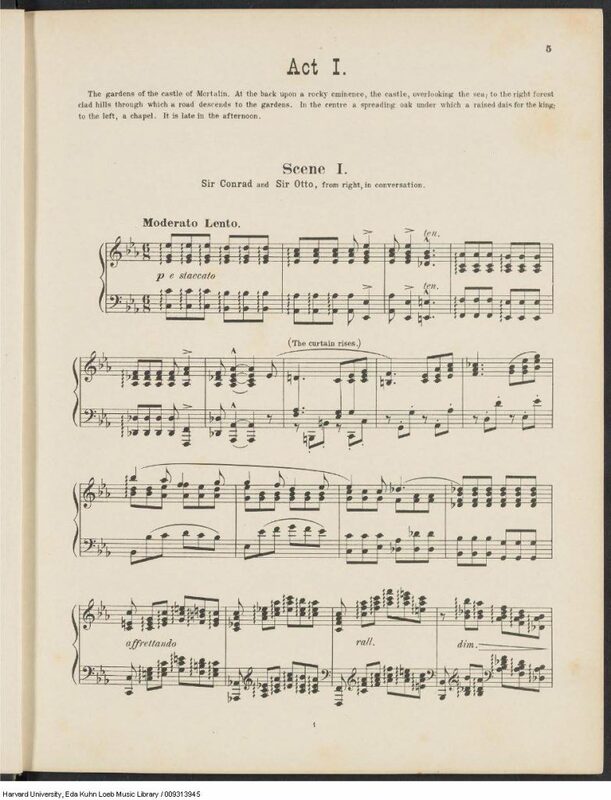 The first contains mostly “plain” (homophonic) psalm and hymn tunes in various hands, including (in my judgment) those of Thomas Hubbard and Mary Jackson Hubbard, Thankfull’s parents. Many of the tunes have handsomely executed titles imitating the style of music engraving of the time; these may well have been copied out of one or more printed collections of psalm tunes. One tune has the name Thankfull Hubbard written next to it. This isn’t an attribution of authorship to either the text or the tune; both of these existed before Thankfull was born. Rather, she may have been pleased with her execution in copying out the tune and text – which is quite nicely done for a young amateur! Many of them are written using oval noteheads, while all those in the first section contained only diamond-shaped noteheads. There are many fuging tunes by contemporary New England composers such as Daniel Read and Oliver Brownson, as opposed to old (anonymous) psalm tunes. Many of the tunes have only the bass part copied out – surely not Thankfull’s customary voice part! Intriguingly, the first tune in this section of the manuscript is William Billings’ “Funeral Anthem”. Might it have been a tribute to the deceased Mrs. Leonard? It would not be the only tribute following her death: the poet Phillis Wheatley wrote a funeral elegy addressed to her on the death of her husband in 1771 (“To Mrs. Leonard, on the Death of her Husband”), and less than two years later, she did the same on behalf of the recently deceased Thankfull (“To the Hon’ble Thomas Hubbard, Esq; on the death of Mrs. Thankfull Leonard”). Walter’s book must have been both easy to use and convenient to carry: besides the Hubbard manuscript, Harvard owns four other copies of Thomas Walter’s book that are bound with 18th-century manuscript music. Comparing multiple copies like this raises some questions about how and why people added to their books. One thing that stood out to me was how similar many of these additions were to each other. For example, all five sets of manuscript additions I cataloged contain the tune “Standish”, in three parts. But it’s not just the tune that’s the same: the layout and often even the style of writing used in the title are similar. More interesting still, this layout often imitates the style of printed collections, such as A supplement to the New Version of the Psalms. This collection was often bound at the end of the commonly used metrical psalter by Tate and Brady and includes many of the tunes later appended to tunebooks; it was printed a number of times in Boston in the early 1750s. In fact, I have noticed mistakes, including a missing part in one tune that is replicated in the copy in Hubbard’s book. This doesn’t mean that Hubbard’s book was necessarily copied directly from this source, but they could easily have been part of the same network of tune transmission. Other possible sources, this time for the later works in the Hubbard manuscript, are Harmonia Sacra compiled by Thomas Butts (not the more famous one by Joseph Funk, which came later) and The Chorister’s Companion compiled by Simeon Jocelin. 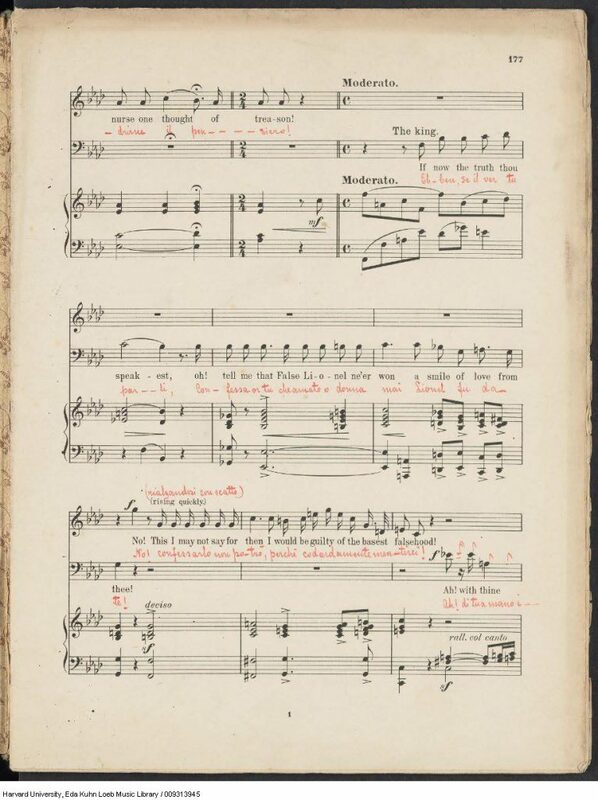 A number of tunes in the second part of the Hubbard manuscript first appeared in print in The Chorister’s Companion (about ten years after Thankfull Hubbard died). Imagine the following scenario: a new tunebook comes out; you buy a copy; you want to sing one of the songs in it with friends, so you copy out your part at the end of your personal collection so other people can look at the book. Looking at manuscript collections gives a look on an individual’s taste and habits, and when multiple collections are examined together, on the taste and habits of a whole community. Music is especially suited to this purpose. Music is a very personal thing; especially in the context of multiple-part vocal music, it must be used actively along with other people. Because of this, I’m looking forward to cataloging other music manuscript collections from other places and times. This post was contributed by Micah Walter, a candidate for the PhD in historical musicology at Harvard University. 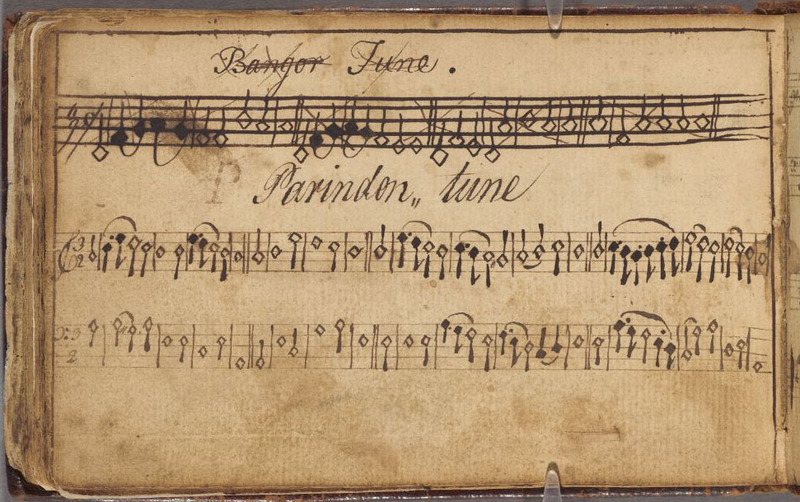 Micah Walter has spent the summer cataloging eighteenth-century music miscellanies in the collections of Houghton Library and Isham Memorial Library. His records appear in RISM, an international music manuscript database which gives more detail than a HOLLIS record can and thus allows a deeper understanding of these materials and their context. The Pforzheimer Fellowship which brought Micah to the Harvard Library is the gift of Carl H. Pforzheimer III, a longtime benefactor of Harvard’s libraries and librarians.